Hours after returning from his second presidential foray abroad, Donald Trump and his representatives were out in force Sunday, calling the trip an “outstanding success.” White House Chief of Staff Reince Priebus, told a television interviewer on “Fox News Sunday” the president was “a star” at the G-20 summit in Hamburg, Germany. 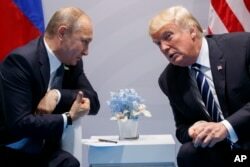 Trump led the charge, firing off a series of Twitter posts highlighting several accomplishments, including a cease-fire in Syria that “will save lives,” and noting that he held firm on sanctions against Russia during his talks with President Vladimir Putin. U.S. President Donald Trump meets with Russian President Vladimir Putin at the G-20 Summit, July 7, 2017, in Hamburg. Trump and Putin met for more than two hours. “If that's our best election defense, we might as well just mail our ballot boxes to Moscow,” Schiff said. By the end of the day on Sunday, Trump had backtracked on his push for the cybersecurity unit, tweeting that he did not think it could happen. Other Trump critics on both sides of the Atlantic have voiced similar concerns, questioning whether actions such as pulling the United States out of the Paris climate accord have damaged America’s reputation as the leader of the free world. Joshua Walker, a fellow at the German Marshall Fund of the United States who was in Germany during last week's summit, told VOA he sees in Trump worrying signs that could portend a decline in America’s standing. Walker argued one individual leader cannot erase 70 years of post-World War Two history. “It’s too early to say America is no longer the leader of the free world, because there’s no alternative,” he said, but also noted the rise of China, the skilled diplomacy of Germany’s Chancellor Angela Merkel in reaching agreement among G-20 leaders and the just completed Japan-EU trade deal all suggest a new era is dawning. 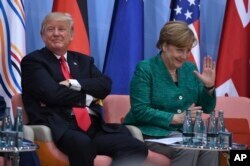 "Unfortunately - and I deplore this - the United States of America left the climate agreement, or rather announced their intention of doing this," Merkel said in a clear rebuke to Trump as she closed the summit. “She hit it out of the park, and showed she could bring people together,” Hamilton told VOA. Other observers say Trump’s biggest success on this trip may not have been at the summit, but in a widely hailed speech he delivered in Poland a day earlier.